The beautiful butterflies descended onto the Tithonia (Mexican sunflower) blooms, reminding me of memorable celebrities appearing at awards ceremonies, fully adorned in fashionable gowns. With hair placed just right, their shoes, jewelry and accessories all contributed to near visual perfection. This time though, we were not in Hollywood, New York or Nashville. I was working those Tithonia blossoms, walking with eyes pealed for extraordinarily fresh winged beauties. Many of the flyers were worn, would not cooperate. They did not pause to nectar, or sadly, were seriously birdstruck. Patience dictated that I not depress the shutter button on my Canon camera. Film is expen$ive and keepers require all the goods: good positioning, good light, good angle to the lens, good luck, good timing and . . .
Then she descended onto a nearby bloom. Oh, there was so much to like: Her blues were gushing. Those swallow tails were whole. Her blacks were solid and dense and orange spots were Florida orange. All of her white chevrons, spots and streaks were straight from make-up. 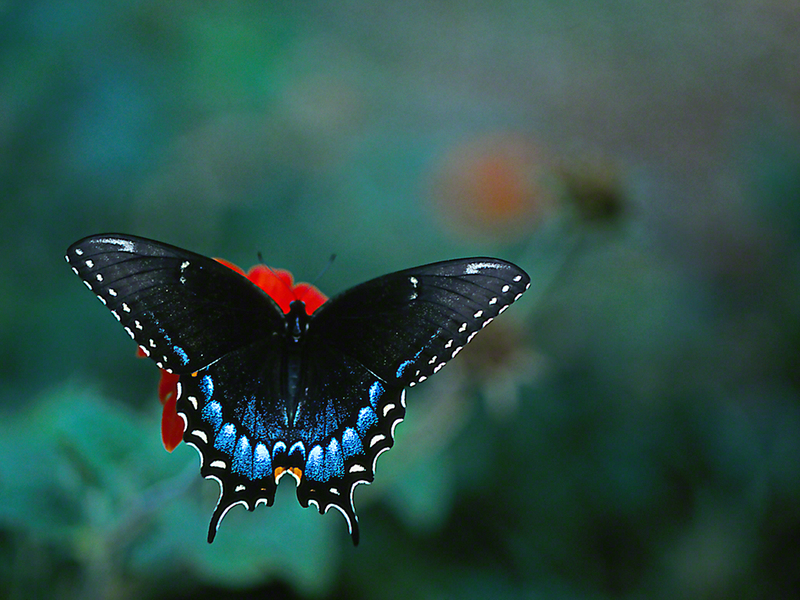 This Tiger swallowtail dark form female was more than Cartiers, Tiffany, Van Cleef & Arpels, all in one. Absolute beauty in the Butterflies & Blooms in the Brair Patch, now pied pipering butterflies to the center of Eatonton, Georgia for what, Virginia, the 4th year now?